The Signal is a publication that is distributed locally. It covers local news including events, entertainment, sports, business, real estate and classifieds. While the legalization of marijuana for medical and recreational uses stands to produce many subsidiary economic benefits, newspapers may run afoul of the USPS by carrying cannabis advertising. Currently, Colorado, Washington, Oregon and Alaska have legalized cannabis, with California, Massachusetts, Arizona, Vermont, Maine and Missouri expected to follow suit in 2016. In November 2015, the USPS regional division based in Portland sent a note to newspapers across the Northwest warning them that, "Advertising that solicits the illegal sale or purchase of marijuana accordingly is not mailable." The note further states that it is against federal law "to place an ad in any publication with the purpose of seeking or offering illegally to receive, buy or distribute a Schedule I controlled substance." The warning could have ramifications for newspapers that rely on the USPS to deliver copies to subscribers. Although legal action may be a concern for publishers, industry leaders think it is more likely that the USPS may simply no longer deliver the publications. "In the past, the U.S. Attorney in each of the cannabis states has turned a blind eye to cannabis advertising in newspapers," writes Marcia Van Dyke, Executive Director of the Washington Newspaper Publishers Association, in an email sent to its members. "It appears from the action of the Portland postmaster that this may no longer be the case." Furthermore, in December, the USPS announced a blanket ban on cannabis advertising in all 50 states. The USPS declared any publication containing ads for pot to be "non-mailable" everywhere in the country. However, USPS employees can't determine whether a particular item is non-mailable and remove it from the mail stream. Instead, the USPS must send a warning letter to the entity who tried to mail it and inform law enforcement about the item. An Association of National Advertisers (ANA) study found that most marketers would shift ad spend due to insufficient third-party measurement. 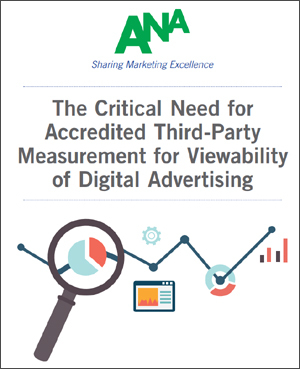 In an ANA survey of 154 members conducted this summer, 90% of marketer respondents also said they are "not fully confident" that their working media meets digital viewability requirements set forth by bodies such as the Media Rating Council (MRC). "The question we asked was, 'Do you think larger digital media owners should allow their inventory to be measured by a [third party]?'" said Bill Duggan, group EVP for the ANA. "I think even if you took out the word 'larger,' [many marketers would agree that] any media owner should be measured by a third-party source." Duggan said that the ANA's committees were "encouraged" that, without any prompting from its own organization, platforms like Facebook, Google and Twitter (which announced video viewability reporting through Moat) had begun to make strides in third-party measurement allowances. Starting immediately, the log-in to Verified's FTP site has changed. Please contact your account representative for revised instructions on how to access the FTP site at 415-461-6006.